It’s been three days since the incident and things are finally calming down. We’ve had a flurry of newspaper, TV and radio interviews. We’ve been inundated with emails and comments from apologetic Kiwis. We met the mayor of Wellington, Celia Wade-Brown, for afternoon tea. Walking down the street the other day, people stopped us to tell us how sorry they were about what happened. So how did it all happen? We are fairly experienced city cyclists. I’ve taken the League of American Bicyclists (the US oldest bike advocacy group) bicycle safety course in the US, an intensive two-day course about traffic and traffic skills. It uses the same theories that are taught by other advocacy groups in the UK and in New Zealand. We’ve applied these techniques for thousands of miles on our bicycle travels without incident. I mention this to point out that we are not rogue cyclists who don’t know how to ride on roads. We had just met up with the NZ Cycle Trail team and the Kennett brothers and were generally feeling good about bicycling in New Zealand. We were riding from the Wellington CBD back to our homestay in Newtown on Riddiford. We were on a 4-lane stretch of Riddiford (which, ironically enough, is next to a hospital), with parked cars next to the curb. We were positioned in the left lane and, because of the parked cars and driveways, we were riding further out in the lane to be seen and avoid any doorings. Traffic was light. The right lane was WIDE open allowing easy passing for a motor vehicle. We weren’t impeding traffic. We weren’t hogging the road. All it would take is two seconds for a car to safely pass in the open lane, just like they would do with any other slow moving vehicle (like a school bus, city bus or truck). Apparently, two seconds is sometimes too much to ask. As we were approaching Mein Street, the silver sedan hesitates behind us, then passes very aggressively. Laura is riding in front of me and and all I see is that the car just barely manages to pass without hitting her. It was completely unnecessary and an obviously intentional scare tactic. In the heat of the moment, we react, just like anyone else who cares about their life or their loved one. It’s a basic human instinct. We generally keep our cool, but there was obvious malice in his driving, and we threw our arms up in a “why’d you do that” gesture. It is not a proud moment when, as a bike advocate, you lose your cool, but I did. Finger gestures where made, to which the driver returned the same. This is where some “blame the victim” usually creeps in and people will no doubt say that I somehow brought this whole incident upon myself, conveniently disregarding the fact that just moments before someone driving two tons of steel had threatened us with bodily injury. This point has always bothered me when I’ve read these sort of stories myself. The cyclist is suppose to not react, to be a Ghandi-esque figure at all times, not registering any discontent at the fact that two tons of steel was just maliciously steered at them with impunity. Forgive this cyclist for being imperfect and human. It was then that time stops and speeds up at the same time. The car stopped, blocking traffic (ironically enough), and the driver bolted out of the car, yelling in a language I couldn’t understand. The hardest thing to understand, and what haunts me still, was the look of incomprehensible rage on his face. When I close my eyes, I can still see his bulging eyeballs beneath his baseball cap and hear him screaming. His anger had completely consumed him, taking over anything that was reasonable or human. It was obvious that this guy had some serious issues that went far beyond us just biking in the road. As he ran at us, Laura managed to dodge him. I attempted to do the same, but he tackled me off the bike, knocking me hard to the ground. It was completely surreal. We spend most of our lives sheltered from violence, so when it comes raging at you it is hard to fathom. Fortunately, where I fell happened to be in a traffic island, so I was in no danger of getting run over by other passing cars. What little traffic there was came to a screeching halt. I got up, stunned, and not fully comprehending the situation. This was not exactly on the agenda for the afternoon. He came at me again, punching me in the face, and I went down again. Still screaming incomprehensibly, he got back in his car, sped off, and ran a red light. Immediately, people came out of their cars and off the sidewalk to offer help and information. People handed us slips of paper with their names and phone numbers to give to the police. I’ve been fortunate in never having been the victim of assault or being met with such violence before. There are a lot of strange contradictory feelings that go on. Why me? Was it my fault? As a bike advocate, I usually read or report about these stories, so it is strange territory to be the subject of one. At weak moments, I wonder if somehow our reaction could have justified his violence. But I remind myself to take the long view and that, for all our yelling (at his initial threat on our life I might add again), his actions are inexcusable. The first day or so, I found myself just staring off and reliving the whole experience again, with infinite permutations. In some scenarios the outcome is much worse, in others I’m the victor – if there can be a winner in this type of thing. Sometimes there are intense flashes of anger and shame where my body just seizes up. I wasn’t quite sure what my reaction was going to be after all this. Would I be terrified to ride on the street again? Would I want to end our tour? Would I be consumed by anger? It’s a little bit of all of that, but also another emotion that I didn’t quite expect – pity. Pity that something like a bicycle could make someone so angry as to lose all decency. I can’t imagine what kind of inner life you must have to fly off the handle at someone riding a bicycle, but it must be hell. I imagine he must have been a kid once, excited to ride a bicycle, and somewhere along the way things went wrong. The other day, we rode past the spot where the incident happened, and I decided to make a video. On the way there, someone honked and I instinctively clutched the bars and wondered if it was him again. Of course, it wasn’t, but it may be a long time until that reaction passes. We’ve been caught up in a little bit of a media frenzy the last few days and it has been exhausting. When the whole thing first happened, my natural reaction was to just quietly forget it all. I even waffled on filing a police report. But I know as a bicycle advocate that it’s important for these stories to be told, to get them into the public consciousness, for however brief. I also knew that, because of our situation as being American tourists and journalists, with connections to several bike groups, the story would spread. If it had happened to any other cyclist, it would have just been another filed police report. Still, it was with some hesitation that we went to the press. Our hope was to turn this unfortunate incident into a “teachable moment,” that beyond the sensationalism of an American tourist being attacked abroad, it would spark some larger conversation about road culture in New Zealand. We applaud the NZ government for investing millions into a wonderful cycle trail network to attract tourists as part of a job creation scheme. That is why we are here after all. But we are finding that, for the cycle trail plan to truly be successful, it has to be part of a larger plan to integrate bicycling. It does no good for an overseas tourists to fly here to ride the 18 Great Rides, only to get honked at while in the city. A lot of people have wondered if we would end our tour in NZ or give up bike travel in general. The short answer is no. Despite this terrible incident, we know it is an anomaly. We have seen so much kindness in our travels in NZ that we know that this is not who the people really are. People also tell us that New Zealand has the worst drivers. Drivers aren’t an anonymous separate species. These same “drivers,” when not in their cars, are hospitable and good people. There is a strange disconnect somewhere that has to be addressed. We are in Wellington for a few more days, then we head to the South Island. We’ll be spending some time in Nelson, which we hear is the most bike friendly of NZ towns, with several cottage industries related to bicycle tourism. From there, we will probably go down the west coast of the South Island. We’ll continue to pedal on. I’ll keep my finger gestures in check and try to leave this nasty incident behind me. I’m sorry you guys ran into that. Road rage is a strange thing. I’ve never been directly threatened in that manner, but it wouldn’t surprise me. There is a *one block* section of my commute where I’m on an extremely narrow road that usually has some two-way traffic on it. Years ago, due in part to my advocacy, (though others on the committee I was on deserve credit as well), sharrows were placed along that road indicating bikes needed to be in the lane. Every morning, when I turn onto the road, the traffic behind me gets impatient. Yesterday, someone accelerated around me almost slamming into the oncoming traffic. Why? Why is that? It’s one short block. It probably takes me less than a minute to traverse that distance. Why such anger at having to slow down to eight miles an hour for less than a minute? I normally have few conflicts with motorists, but this impatience is something that I just don’t get, and I know that it’s only the hurry people are in that prevent it from turning into a confrontation like you experienced. Ive been in these circumstances a number of times.two important notes.The first is that you never know who is driving round.Second is that a vehicle is a deadly weapon.Ive learned that whatever is right and wrong I find it’s easier to avoid confrontation at all costs and we all need to be conscious of these facts all the time.Good luck fellas don’t let it get you down. I’m glad you are safe and particularly, that the assault’s not got you off your bikes. I know it messes with your head, though that’s unfortunately part of the normal process you go through. I must say you do come across as remarkably forgiving: all respect to you for that. Yep, I’m shocked and suddenly a bit embarrassed and defensive about NZ drivers. Some people (drivers in this case) have stuff in their lives that comes out on the road. There’s no way violence can be justified – it’s not just rage (those hand signals! ), it’s assault; not an ‘accident’ or ‘incident’ but an assault. I hope your decision to publicise pays off. We need to be reminded (often) how dangerous cars are and how inexcusable crap driving is, let alone assault. I’m wishing you all the best for the rest of your journey – tail winds, downhills and friendly drivers the whole way! Thank you for putting yourselves out there in the media to highlight this problem in NZ. The insanity and rudeness of NZ drivers is a far bigger problem than just endangering cyclists. It goes much deeper than that. There are many rogue drivers out there who would drive very close to cyclists just to intimidate them. This is caveman mentality. Keep up the good work and spread the message to other international media to give more pressure to the NZ authorities to do more than just filing a complaint. We are talking about lives here and it’s just plain sad that it’s regarded as just another road incident. Thank you Russ and Laura! I understand your self-analysis over your reaction but I think it’s totally justifiable. I had an instance years ago where I was cycling by myself, climbing a particularly long and arduous hill in the NY Adirondacks, when a pick up driving 60 mph nearly tagged me, literally swerving toward me as if they were trying to hit me. This was on a road empty of traffic and in the middle of nowhere (no homes or businesses in sight). I LOST it, waving my arms, cursing loudly and giving them the finger. Immediately after I flipped them off, despite that they were already zooming up the hill ahead of me they slammed on their brakes and started backing up. I was SHOCKED. With a cliff on my right side and a truck coming down at me, with no one else in sight, I could only turn around and race as fast as I could back down the hill. They ended up giving up and drove on but I was shaking for the rest of the day & it was enough of a scare that I never rode without a cell phone again. There is something seriously wrong with people like that. And I don’t think we should not show how we feel when it comes to such life and death situations. We don’t (and shouldn’t) meekly sink into the corners when someone assaults or threatens us, whether we’re on the bicycles or off of them, nor should anyone expect us to. I know others disagree with me, and sometimes you do need to back down to avoid further confrontation, but it’s the same old story of blaming the victim, as you said, when it comes to the initial reaction to aggressive behavior. It’s B.S. So sorry this happened to you. Hope the rest of your trip will be more peaceful. You have been very brave, confronting your feelings about what happened and being willing to talk to the press and government about it (instead of just wanting it to go away). I have been in a similar situation (the aggressive cut-off for no reason, not the physical attack after) and I don’t actually believe there is a way to keep from responding in some way. It is an inherent, physical reaction – you are threatened, you respond. Anyway, you are turning this into such a positive thing by opening up a conversation about it – I am inspired and reminded of why I love following your and Laura’s journey. Much love from Colorado. But has the suspect been apprehended, is I think the biggest question in everyone’s mind. I got the impression that a license plate # was recorded by kind passers-by, so…??? Glad you are both okay! I cycle twice daily through that area on my Dahon. Thank you for reporting it. You may have made it slightly safer for me. That sounds like one very deranged individual. I know it’s not easy, but the buddhist values in me work to consider the struggle that guy is going through. I think (Russ) you touched upon this in your write-up. Glad you weren’t hurt worse than you were. I am a US citizen and a NZ permanent resident, happily living in Wellington for over four years. I do not own a car and bicycle commute every day to work on my Bike Friday (made in Oregon!) though I will use my Brompton when I take the train. I was truly shocked and upset to hear that this happened to you. I hope some positive change comes of it. i was actually in a hit-and-run incident on the same road in front of the hospital last year. ironically, it was a witness who drove up and started yelling so loudly at the offending driver that she drove off in fright before i even got a chance to get any details. i could only remember half of the registration number, so by the time i got home and reported the incident, the police said their was nothing they could do. i still have some paint from the car on my quick-release. i haven’t cycled in the US in over 10 years, but despite the auto-centric culture there, i think i’ve been in more close calls and actual incidents in my 3 years here than my 30 years in the US. feel free to contact me if you need a place to stay while in wellington. my partner and i will by cycling in the south island in february, so we might see you on the road. Nice piece, though discouraging that circumstances like this led you to write it. You seem to have placed your incident in a context you can live with. Would that all of us had your patient mind set. I wonder, though, if the incident had a more severe outcome to you if your post would have a different tone? Ride strong, and thanks for all that you do for bike advocacy! Glad to hear you’re enjoying NZ on the whole despite the wacky weather and the guy with road rage. NZ drivers definitely need more education about how it is for cyclists. I’m afraid a lot of them do have the idea that once behind the wheel they own the road and their precious car is more important than anything else. I think that with more cycle lanes and routes such as the NZ Cycle Way there will be more locals getting out on bikes and their experiences will change the way they think about how they drive and hopefully they will influence those around them. Indeed it wasn’t till I started to use a bicycle as my main transport that I realized how my driving could affect negatively cyclists. Now I treat them as horses on the roads giving them wide berths and slowing right down. Cyclists too need to be aware of how their behavior affects others on the road. From what I see and hear you guys cycle safely but I have seen a group of cyclists (up in Auckland) who have ignored basic road rules and basically been all over the place-an accident waiting to happen. Just because you have a car or a bicycle doesn’t mean you can’t share the road safely and happily. Thanks for being great cycling advocates and sharing your stories on the web. Just want to say, I’m really glad you and Laura are ok. It’s a bummer for sure. I’ve had incidents happen to me too, in the States, where a car unnesesarily swerved in front of me because they were pissed, and have had cars dangerously follow too close. Whether they were angry or not, it’s shocking how people are “out of it” in their cars. Lastly, I’m touched to read all of the Kiwi’s response, I hope their words of kindness heals you…and in an interesting way, you are helping them to talk about it, hopefully to improve bike awareness. Take care you two, come home safe! Glad to hear you are fine. In 2008/2009 I had the wonderful opportunity to tour NZ by bike and van for about 3 months. We added about 10,000K on the van and probably 500-1000K on the bike. I must say, NZ people are some of the best in the world, but something happens to them when they get in a car. It does not matter if you are in a bike or car, you will be the recipient of their unnecessarily aggressive driving. It is a shame, really, that I think could be relatively easy to solve with some simple enforcement and education campaigns. Thank you for not writing off all Kiwis, and for continuing your stay here. I’m embarrassed about your xperience. However, although it was extreme it sadly typifies the attitude of too many NZ drivers. A ‘Radio Live’ talk-back presenter discussing your experience said “Arguably, the roads are for cars and motorcyclists”.I couldn’t believe this! Our roads are also for cyclists, horses and livestock. Last year Ann and I cycled 3500 km on our touring tandem from Vancouver BC to Denver CO, over 2 1/2 months. We used cycle paths, minor roads, major roads and interstate highways. Of the thousands of drivers who overtook us, all but one considerately gave us plenty of room. When necessary, drivers slowed until it was safe to overtake us. In contrast, within a fortnight of our return to NZ in October (and in less than 100 km), I experienced three instances of driver carelessness and inattention on local roads while cycling. Any of them could have caused me an accident. Most NZ motorists, like American ones, look out for cyclists and treat us well. However, in this country a few drivers seem to regard us as enemies, or just don’t think about us. Wow! Glad you’re ok, and sorry to hear that road rage is alive and well everywhere. Keep on pedaling, and I hope I get a chance to buy you both a beer next time you’re in Portland! I am sorry to hear that you got hurt. Seeing Russ not wear his contagious smile in the picture above is sad. You guys are handling this very well. Don’t back down or give in. Your are doing Good work out there, finding the stories that need to be told ( Damien Day) for example. I feel your emotion, seeing someone cut off Laura would definitely enrage anyone with a pulse. Do not blame your self, that guy is a moron. Keep the pedals turning and keep smiling! Unfortunately this is not a rare occurance in NZ and you will find your lives threatened many more times in the South Island especially Christchurch. You will also get no sympathy from the police who seem to take the view it is normal behaviour for motorists to regularly kill cyclists.One incident I was involved in a couple of years ago where I was deliberately run off the cycle lane into the kerb and then forced to stop by this mad idiot because I was “stupid”? enough to give him a rude gesture. He attacked me and despite a large rucksack on my back and only one hand free I managed to ward off his attempted blows and managed a couple myself. The police in their wisdom arrested & charged me with assault and refused to investigate his driving infringments. Luckily the judge threw it out because “MR. ANGRY” motorist didn’t show up in court but it still cost me lots in legal fees and hassle. The police seemed determined to criminalise me despite glaringly obvious lies and impossibilities in the statement made by the motorist !Talk about police ineptitude and disinterest for cyclists !! I read your story. Please, please do NOT blame yourself!!! So what if you gave the gesture? That guy DESERVED IT and MORE! Don’t waste any more time blaming yourself. It is the guys fault, totally. Having said that, knowing that in this world there are unstable jerks out there, just for your own well being maybe refrain (if you can). But just for yourself. Not for them. The jerks of the world deserve it. So sorry. I wish you happy and safe cycling and know millions of us support you. I’m just thankful both of you were not more seriously injured in the attack. And make no bone about it, a deliberate attack it was. As a frequent rider on Auckland’s roads I regularly encounter intimidator behaviour on the part of motorists. Usually in the form of passing very close or pulling out in front. Unfortunately New Zealand’s roads are not safe for cyclists. Five cyclists killed in a single week in 2010 is evidence enough of that. Something the NZ Government is well aware of and as yet has done very little about. In spite of this I will continue to ride my bike, as I am sure you will also, because we love it and it’s the right thing to do. Thankfully the Nationally Cycle Trails are predominantly off road and safe from crazy motorists. Best wishes for a safe and enjoyable remainder to your journeys in NZ. Welcome to our world. Though I moved to NZ several years ago, I’m still astounded by the number of aggressive, angry, incompetent drivers here, and especially by the harassment of cyclists, which is familiar to anybody who rides regularly. Thanks for pointing out that spending on bike tourism is going to be wasted if people don’t feel safe riding in the cities: it’s a point that bike advocates here have been trying to get across. I’m very sorry this happened to you, and I hope the police are able to identify and charge the driver. I wish you better experiences during the rest of your visit. glad to hear today that they have arrested the scum. If you passing through the Manawatu drop us a line, theres always a bed and laundry facilities here. Just chatting online with Damian and told him the good news and he’s please to hear. 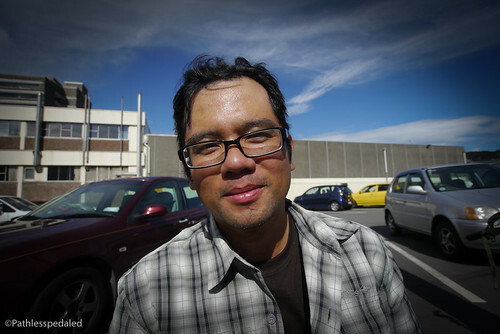 I’ll be seeing him in 2 weeks in Taranaki. It appears the offender has been arrested, and will now have to explain himself in Court. Hope you enjoy the rest of your travels in NZ and take with you many happy memories that will outweigh this incident. I grew up in Chicago and you never know what kinds of crazy are out there. Be non-confrontational. What if he had a knife or a gun. I think the hands in the air is okay, but the “finger” is aggressive. For almost 20 years I’ve used an AirZound bike horn. You pump it with your bike pump and it sounds like a stadium horn. The newer models are 105db plus. As loud as a car horn. Works in all but the coldest weather. Very satisfying to honk. However once a dozen years ago I honked at a car that got too close and the woman (!) driving came unglued. She started darting at me from behind. Rather than pedal away I used my first cellphone to call the police who arrived in one minute. Although I feel you were wrong to flash a finger, if this much more agrressive, angry, dangerous person can be found and helped to manage and avoid such anger, you will have saved others including himself from a subsequent potentially worse tragedy. Sorry to hear about the incident. In Wellington, cycling will always be a fringe activity given the geography, narrow streets and weather. It may be an unpopular view, but cycling in Wellington is not a good idea, any more so than walking the backstreets of Rio at night is a good idea. Sure, you’re free to do it, but the environment is inherently dangerous, so needs to be weighed carefully. Bike lanes are uneconomic and impractical in most cases. Drivers attitudes are unlikely to change anytime soon anymore so than the attitudes of child abusers are likely to change. It’s a nice idea, just don’t bet your life on it. Thanks for going public. This is not an isolated incident. Riding a bike in Wellington can be dangerous as there is a small number of drivers who believe that cycling should be actively discouraged and act accordingly. It is not helped by political silence and police apathy. I have been deliberately run off my bike. When calling emergency services I was asked if it was an ‘injury accident’. I complained to the Police (with witnesses)about a truck that passed too close and was told it was his word against mine. So sorry to hear about the road rage incident, but very glad to know that you’re alright, despite being a bit shaken up. Also goad to see that you aren’t letting one idiot change your plans, or alter your view of kiwis. An incident such as you experienced can happen anywhere. Someone did an identical “ultra close pass” to me last summer, right here in Oregon. After passing me, his passenger, yelling and screaming, pointed to the shoulder indicating I should be off the roadway. The shoulder was rough gravel and not suitable for a road bike. I resisted the urge to react, mostly because there were two of them and I was alone. But I totally understand your “losing your cool.” It’s frightening and incomprehensible that someone could be so callous about threatening your very life with their vehicle. And it’s maddening. Extremely maddening. Very glad to see the moron caught. Ride on, and enjoy your travels. I bike most days in Auckland and expect at least one near-death/injury incident every 8km’s due to aggressive drivers (whose only gain is getting to the next red light 5-8 seconds earlier). I found biking in the States, Scandinavia, Germany and even India far safer and pleasanter. Even the sweetest, nicest people in NZ (like our favorite Aunt) become foaming mouthed, homicidal psychopaths when they drive near a cyclist, pedestrian or scooter. Presumably it’s because we all grew up in small towns where you could always drive where ever you wanted and park right outside without the slightest hindrance. Now that some of those small towns are becoming cities folks just can’t cope. Good luck with the South Island – it’s very nice (apart from the drivers). Nasty, weird, and totally irritating experience – I feel like I owe you an apology on behalf of all New Zealanders. There was that brief moment where I thought that I should whack him back, really hard, or throw my bike at him, either of which might truly have finished him off for good…. but then I’d be up for manslaughter. Luckily the red mist of rage subsumed in time, and I merely swore, loudly, repeatedly, and the woman was most apologetic, basically asking me please not to hit / polish off her old dad. I’m quite a big bloke, so people don’t normally punch my lights out… but I can say truthfully I’ve been king hit by a grand-dad! Really odd incident – put me off riding on cycle paths for quite a long time, and i just went back to riding on footpaths, where I had never had any issues. I guess the thing is that he obviously had not realised that he was walking on a cycle path, and reacted with heat of the moment rage, just like the guy that hit you. Good on you for not hitting back – I don’t think I would have been so calm in that same situation. Have a great rest of your trip. Russ – Glad to hear you’re alright! This is a terrible tragedy – as I started reading your story, I almost wanted to stop planning my own tour in NZ. I just received a Lonely Planet Cycling in New Zealand Book and still can’t wait to make this a reality. I’ve been in similar situations as you and way more frequently over the past 5 years since moving to Vermont. Burlington has some crazy folks, not to mention 3 colleges. I remember 2 summers ago while working at The Old Spokes Home – a shop here in Burlington, I was riding out for lunch when a man in his mid 50s or so pulls right right up next to me, screaming expletives and proceeded to try to pinch me against the parked cars on the street. Luckily, I was able to dodge him up a driveway and continued on the sidewalk while he literally followed me for 4 blocks. I then stopped and told him I was calling the police. He got out of his car, came at me and I fled down the one-way to my right. Unfortunately, I never heard anything from the police report I filed, even though I had a license number and all. A similar situation happened to my girlfriend at the time where she was intentionally run off the road by a landscaping truck, and to this day 3 years later is yet to receive restitution. Unfortunate to read, but it’s good you’re getting the message out there. People need to start realizing bicycles are people’s transportation too. Always carry a knife with you, just in case. I’ve reviewed your commentary on this incident, this isn’t an incident of bike rage, it seems clear this is a man who has taken a number of drugs and would likely have attacked anyone. You have just been very unlucky that it happened to be you. Making big sweeping statements about bike culture isn’t addressing the fundamental issue of some people being bad. At least in NZ we don’t carry guns. I really don’t think this is about advocacy, this is about you being unlucky to be in the wrong place at the wrong time, someone could have been walking down the road with a pair of yellow trousers and that might have similarly annoyed him. We had good luck on the TransAmerica and rode away with no incidents. Though ironic as it is once I got home to Austin, TX there was a incident. It was ACL (Austin City Limits) festival and my wife and I drove our little Insight car to the event parking in a neighborhood. We had a great time seeing the artist and it occurred when we were leaving to go home. Having drove we walked back to where our car was parked and just as we sat down, key not even in the ignition yet, a cyclist runs into the car rolling onto the windshield. I jumped out of my car yelling “dude, you ran into my car”. This I wasn’t expecting; the cyclist landing on his feet from the incident jumps in my face pining me between my car door and the door jam, yells “yeah, what are you going to do about it”. It was apparent he was drunk and I should of kept my cool, but in the quick of things I grabbed him by the shirt with two hands and backed him halfway across the street from my car. During this he starts throwing fists and I shoved him to the ground. Due to his inebriated when he went to the ground he took a header and came up bleeding and swinging. About this time his buddies on bikes showed up and they were pulling us apart. Knowing it was a group of guys on bikes and me in the car I knew how it looked. So something I still laugh at now, I started saying stuff like “I am a cyclist too..” & “I rode the TransAm this year” trying to show this had nothing to do with the class warfare; in hind sight it still cracks me up thinking in the moment this was a solid defense. I think it’s funny how polarizing drivers and cyclist are and the issues we have with each other; even though we are one in the same. Russ I am very happy you are safe and hope neither you or Laura have the run of bad luck again, y’all are an inspiration and keep on riding! I’m rather late to reading about this, but just wanted to say that I’m glad you are both safe. This was clearly a person with tremendous rage and you happened to be the very unlucky target for said rage. I doubt it’s the first time he’s gone off on someone. Your reaction was totally natural, and something I’ve done many a time. May have to reconsider that given what kind of reaction it could produce. Very scary. Be well. Be safe. Keep pedaling. Really sorry to hear about that truck/bike thing in NZ. I know how that can really shake you up in all sorts of ways! Glad you both were not too hurt. I also have relented and exchanged “the finger” with a couple of drivers (and, no, I was NOT very proud of myself for it, but, like you said, when you have been threatened, everything changes fast!). I commute-ride a lot around my city, and lately I have noticed I get treated more coldly by businesses, and I finally realized that I am getting associated with being a homeless person! We seem to have a lot of them around here in the inner portion of Wichita, and so it’s guilt by association,I guess! I’m so glad this ultimately didn’t dampen your spirits, and that you continued on (and still tour to this day!). When I first started seeing references, half a dozen posts back, I was beginning to think whether I was wise in planning to start in NZ. But then I realised that this can still happen anywhere – particularly in my home town of Sydney!